The L 14th Street–Canarsie Local is a rapid transit service in the B Division of the New York City Subway. Its route emblem, or "bullet", is colored medium gray since it serves the BMT Canarsie Line. The L operates at all times between Eighth Avenue in Chelsea, Manhattan, and Rockaway Parkway in Canarsie, Brooklyn. It also briefly enters Queens at Halsey Street, serving the neighborhood of Ridgewood. It is the first New York City Subway service to be automated using communications-based train control. The L commenced its current route and service pattern upon completion of the Canarsie Line in 1928. Express trains formerly ran along the L's trackage in central Brooklyn, running along the BMT Fulton Street Line in eastern Brooklyn, but were discontinued in 1956. Since then, the L has been entirely local. For the history of the trackage, see BMT Canarsie Line § History. The L, being a local train, was originally given the LL designation when letters were assigned to the BMT division. From 1928 to 1967, the same service was assigned the BMT number 16. Before the 14th Street–Eastern and Canarsie Lines were connected, the Canarsie part of the line already had a number, 14, running from Lower Manhattan via the Broadway Elevated and called the Canarsie Line. 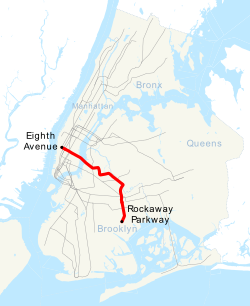 When the 14th Street–Eastern Line was connected in 1928, this was renamed the Broadway (Brooklyn) Line, but continued to operate to Rockaway Parkway. This brochure describes the inauguration of special rush-hour through service in 1936 for the BMT between Lefferts Avenue and 8th Avenue. Starting on September 23, 1936, express trains ran to Lefferts Boulevard via the connection with the Fulton Street Elevated at Atlantic Avenue. This connection was severed on April 30, 1956, then the service ran to Rockaway Parkway again, but was discontinued on August 23. The R27 to R38's roll signs had both L and LL for express and local service, even though the express never ran thereafter. On November 26, 1967, with the opening of the Chrystie Street Connection, the BMT Eastern Division lines were given letters. The 14 to Canarsie was given the label JJ (though the 14 main line was designated KK, continuing east from Broadway Junction towards Jamaica). On the other hand, the 16 became the LL. Canarsie service to Lower Manhattan was discontinued in 1968. When double letters were dropped on May 5, 1985, the LL became the L, and it still has that designation. Skip-stop was proposed in the 1990s, but was never implemented. Ridership on the L has increased dramatically since 2000, since many neighborhoods along the route have experienced gentrification. The Metropolitan Transportation Authority's $443 million fleet of subway cars on the L was introduced in 2002, but by 2006 was already too small to handle growing ridership. The Transit Authority had projected that 212 Kawasaki-made R143 subway cars would be enough to accommodate ridership demands for years to come, but ridership has risen higher than expected. Therefore, sixty-eight new R160A cars manufactured by Alstom were equipped with CBTC so they could run on the L.
The BMT Canarsie Line tracks underwent an extensive retrofit over to CBTC, a system that controls the trains via a computer on board, as opposed manually operated by a human operator. This was completed in April 2012. While the retrofit has resulted in nearly two years of service changes and station closings, this system will eventually allow trains to run closer together, and enables in-station "countdown clock" displays to note the exact time until the next train arrives. The line also used OPTO (one person train operation) beginning in June 2005, but a combination of public outcry regarding perceived safety issues, which increased after the July 2005 London tube bombings, heavy lobbying by the Transport Workers Union of America (TWU), as well as an arbitration ruling that MTA had breached its contract with TWU caused the Metropolitan Transportation Authority to end OPTO the following September. However, the MTA's successful implementation of countdown clocks on the L has been the first in the system. Starting April 27, 2019, and continuing until 2020, service will be limited between Third Avenue and Bedford Avenue on late nights and weekends to allow for repairs on the Canarsie Line tunnels under the East River, which were badly damaged by Hurricane Sandy in 2012. This will last about 15 to 20 months. The original plan was for a full 15-month closure, but the plans were revised in January 2019. The L uses the following lines with the same service pattern at all times. The L runs on the BMT Canarsie Line in its entirety. Wilson Avenue ↑ Station is ADA-accessible in the northbound direction only. ^ Some southbound trains terminate at this station during a.m. rush hours; some northbound trains originate at this station during a.m. rush hours. ^ a b "L Subway Timetable, Effective June 24, 2018" (PDF). Metropolitan Transportation Authority. Retrieved June 24, 2018. ^ "MTA Colors". MTA.info. Metropolitan Transportation Authority. Retrieved June 7, 2017. ^ "Queens Bus Map" (PDF). MTA.info. Metropolitan Transportation Authority. January 2017. Retrieved June 7, 2017. ^ "CELEBRATE OPENING OF SUBWAY LINK; Civic and City Officials Ride in First Train Over 14th St. Line to Brooklyn". The New York Times. June 1, 1924. Retrieved April 16, 2018. ^ "EXPECT GAIN ON B.M.T. LINE; Officials Say Old Habits of Patrons Hold Down Canarsie Traffic". The New York Times. July 17, 1928. Retrieved April 16, 2018. ^ "B.M.T. TO SPEED UP QUEENS SERVICE; New Multi-Section Cars to Be Used for Special Rush-Hour Trips Starting Wednesday". The New York Times. September 21, 1936. Retrieved April 16, 2018. ^ Hofmann, Paul (July 1, 1968). "SKIP-STOP SUBWAY BEGINS RUN TODAY; KK Line Links 3 Boroughs --Other Routes Changed". The New York Times. ISSN 0362-4331. Retrieved November 27, 2016. ^ "Hey, What's a "K" train? 1985 Brochure". Flickr - Photo Sharing!. Retrieved June 17, 2016. ^ Mays, Jeff (April 21, 2015). "MAP: See How Much Subway Ridership Increased at Your Station". DNA Info. Archived from the original on April 23, 2015. Retrieved May 5, 2015. ^ a b Fitzsimmons, Emma G.; Goldmacher, Shane (2019-01-03). "Full Shutdown of L Train to Be Halted by Cuomo". The New York Times. ISSN 0362-4331. Retrieved 2019-01-03. ^ Fitzsimmons, Emma G. (April 3, 2017). "M.T.A. Shortens L Train Shutdown to 15 Months". The New York Times. ISSN 0362-4331. Retrieved April 4, 2017. Wikimedia Commons has media related to L (New York City Subway service). "L Subway Timetable, Effective June 24, 2018" (PDF). Metropolitan Transportation Authority. Retrieved June 24, 2018.